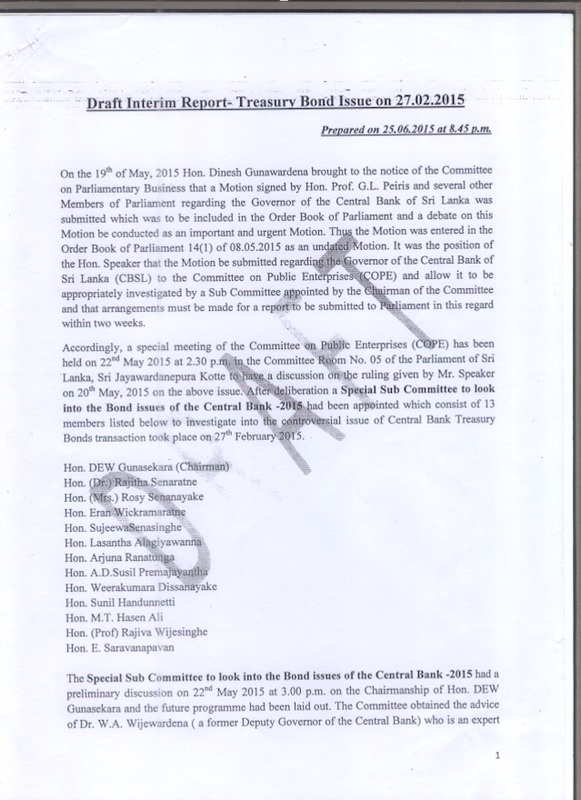 The 13-member Special Parliamentary Investigation Committee that probed the alleged insider trading and favoritism in the recent treasury bond issue has established Central Bank Governor Arjuna Mahendran’s direct intervention on behalf of his son-in-law Arjun Aloysius owned Perpetual Treasuries. 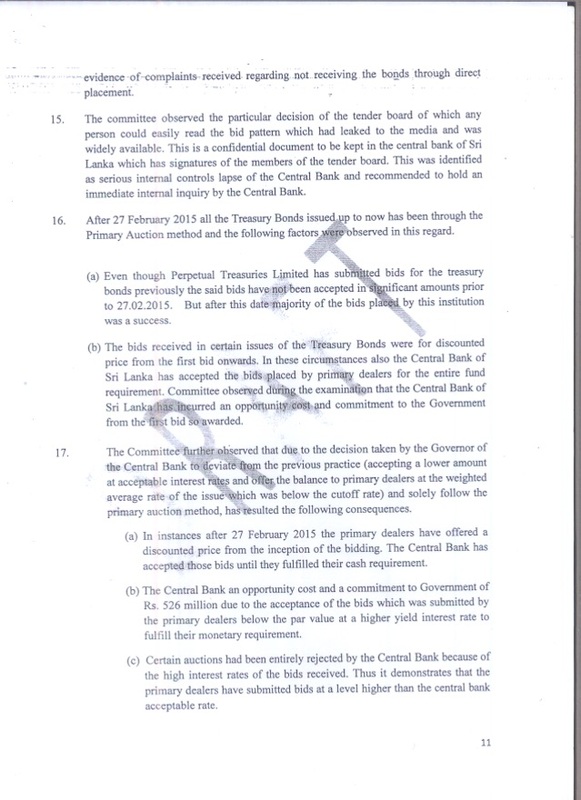 Last month, the three-member lawyers committee appointed by Prime Minister Ranil Wickremesinghe to probe into the controversy that has emerged over the issuance of Treasury Bonds has said that the Central Bank Governor Arjuna Mahendran had no direct role in deciding to accept bids over and above the one billion rupees stipulated in the 30-year bond tender and accept up to 10 billion rupees. The parliamentary committee comprised Chairman of the Committee on Public Enterprises (COPE) and General Secretary of the Communist Party, DEW Gunasekera, Minister of Health and Indigenous Medicine Rajitha Senaratne, State Minister of Child Development Rosy Senanayake, Deputy Minister of Highways and Investment Promotion Eran Wickramaratna, Deputy Minister of Justice Sujeewa Senasinghe, UPFA MP Lasantha Alagiyawanna, Minister of Ports, Shipping and Aviation Arjuna Ranatunga, Democratic National Alliance MP Sunil Handunetti, Minister of Ports, Shipping and Aviation Arjuna Ranatunga, UPFA MP Susil Premajayantha, UPFA MP Hassan Ali, Prof. Rajiva Wijesinha, UPFA MP Weerakumara Dissanyake and Illankai Tamil Arasu Kadchi (ITAK) MP E. Saravanapavan. The Parliament had never before appointed a special committee comprising members of COPE to investigate a specific allegation against a senior state official. The committee received the expert advice of former Deputy Governor of the Central Bank W.A. Wijewardena. Apart from the expert advice, prior to the investigation COPE members were given a two day class by Dr. Wijewardena. We publish below the interim report prepared by the committee, the sudden decision to dissolve effectively stopped the report from being tabled in Parliament. 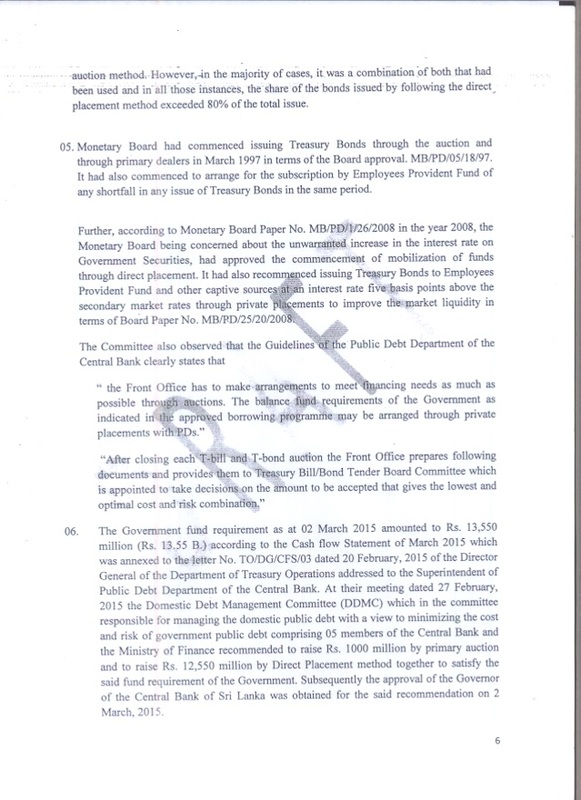 CB Governor should be suspended/terminated with immediate effect pending further investigation. That will set a very good example and will do a world of good to the Yahapalanaya. Then and only then can all the ROGUES, THUGS AND PLUNDERERS OF MARA REGIME can be prosecuted in the like manner. Over to you MS/RW, let us live by example and set the record straight once and for all. We the voters demand this from you for the sake of our country and by virtue of casting our valuable votes to you thereby sending THE MOST CORRUPT MARA REGIME HOME. We do not need another corrupt regime in place of MARA regime. Enough is Enough. Hope the voters voice is loud and clear. So, The Central Bank Governor – Arjuna Mahendran. was authorized ti issue Rs,. 1,000 Million in bonds, and that is what the State wanted. So Authorized Rs. 3,000 Million. That was not authorized. Can the State give the Money back? What were the contract terms? 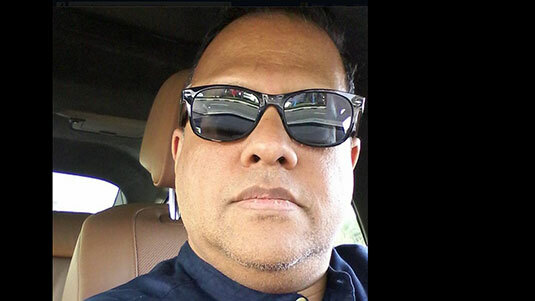 Does the Central Bank Governor – Arjuna Mahendran, love his son in Law or hate his son in Law? Ask his daughter? 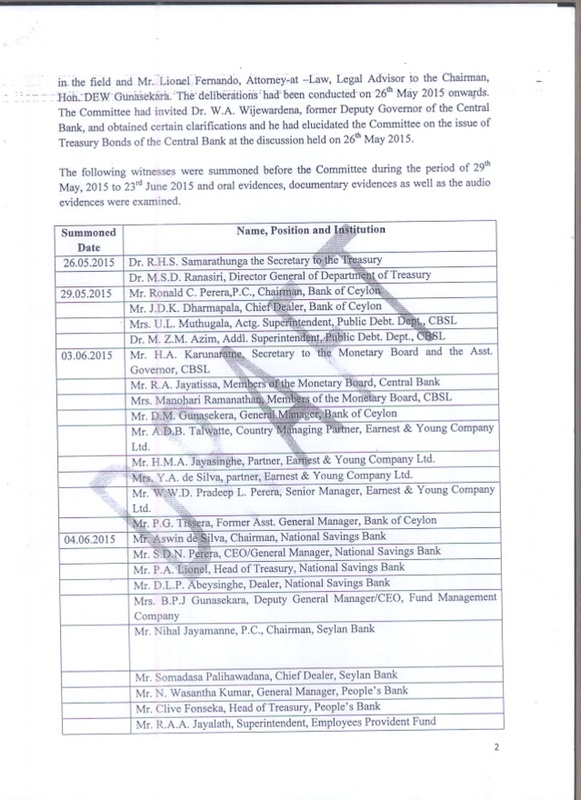 Today the Sri Lanka economy and citizens are paying a heavy price for Ranil Wickramasinghe and Ravi Karunanayake’s corrupt crony, Arjuna Mahendran’s, doings at the Central Bank. Mahendran is not a trained economist and only has a basic BA degree in economics, with some experience as a stock market dealer. He is NOT qualified to hold the position of Governor of the Central Bank who should hold and advanced degree preferably a Ph.D from a recognized university in Economics. 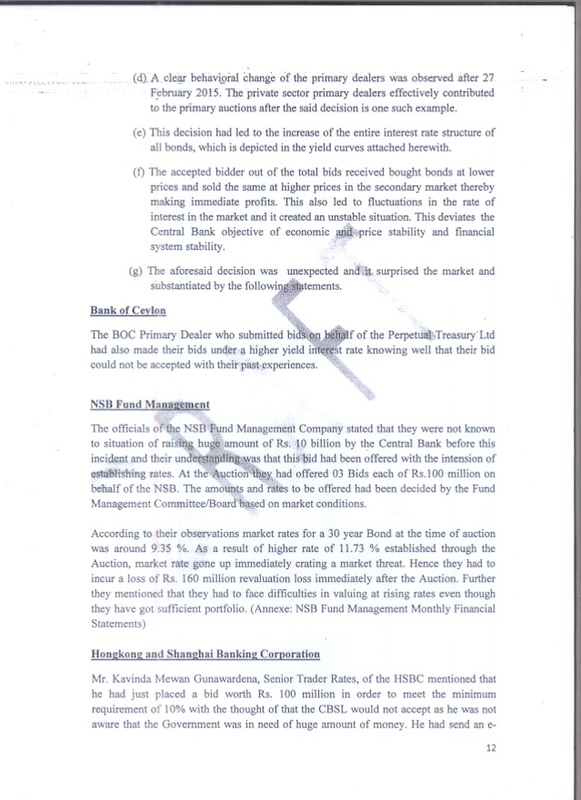 Mahendran’s son-in-law, Aloysius had information and submitted bid specifications that no other bidder of the Central Bank bond issue had, as indicated by the size of the bid advanced by his firm.. We don’t need a COPE report to tell us that this could only be due to him having PRIVILEGED INFORMATION and this constitutes INSIDER TRADING between Mahendran and son-in-law. it does not take a rocket scientist to infer this. This, insider trading is what Raj Rajaratnam and Gupta were convicted of in the US and Mahendran and son-in-law must now be tried and locked up. 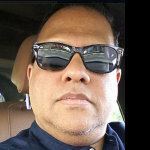 President Sirisena should NOW and he should have immediately removed Arjuna Mahendran pending independent inquiry at the time that the bond scam was revealed. Once Mahendran is tried and convicted, so too must the other corrupt clown who was governor of CB – Nivard Cabraal, who as Mahindar Jarapassa’s crony, must also be tried and his assets ceased for currency manipulation and trading with pension funds. Cabbaraala is more than just a clown.He is a Ponzi master who dupes people with the slickness of a magician. His assets and ill-gotten money must be investigated next by the Income Tax authorities. Terribly regretful! The worst day for Good Governance since 8th January 2015. MS & RW must quit playing games with this issue and at once come clean. Any further delays will dent their own reputations already on trial. Corrupt and cunning Rajapassa is reaping PR benefits from this sordid affair. Once this affair is sorted out , a real example will be set for all to see. Then GOSL must go after all cronies of the criminal Rajapassa band wagon with a vengeance. Starting from CB’s kicked out corrupt Governor Nivard Cabraal himself, Rajapassa family members & henchmen. What are exactly waiting for? Whom are we scared of? Why? There is no reason what so ever to wait for. Just implement the law. It is no good just suspending this crook. The government MUST make their transaction null and void, and confiscate their investment and transfer it to public trasury. What is CT trying to achieve by publishing a “draft”?? 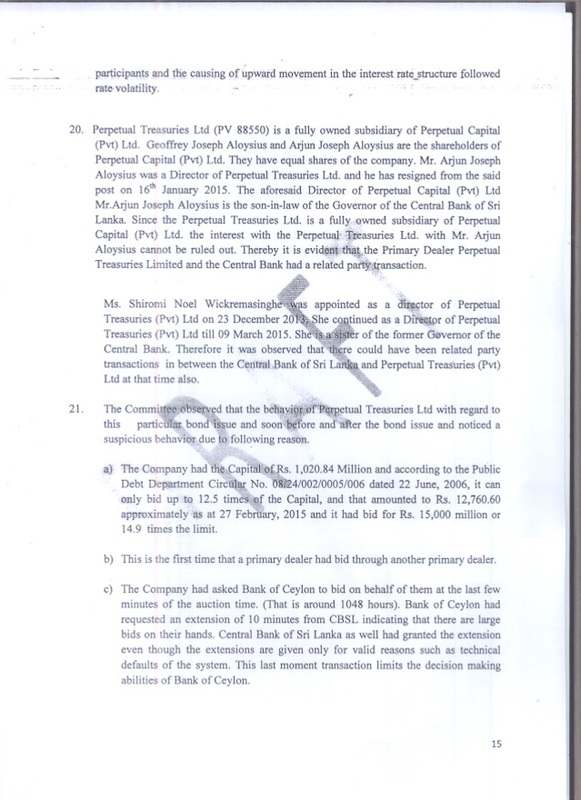 Where does it say in this “draft” that Arjun Mahendran was involved in insider dealing? This investigation has blown the lid off how MR’s gang (with Cabraal as his pawn) had been ripping off funds through Private Placements. COPE was manipulated to hit RW and UNP, but it has exposed the “day light robberies” of the past! 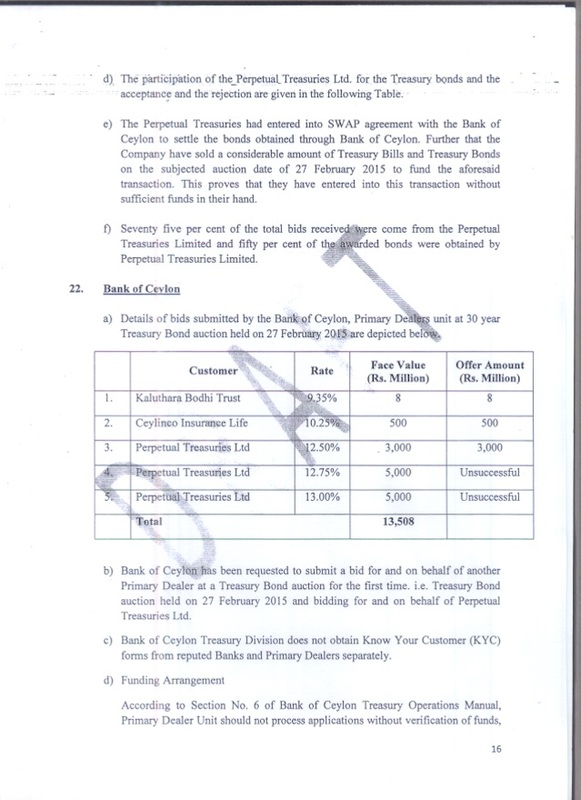 It is obvious from this “draft” that Perpetual Treasuries was getting inside information even in the past. Cabraal’s sister in the Board of PT is a case in point. Its well worth investigating who benefited from Private Placements and whether it was in line with the CB Operations Manual. This is the crux of the matter and someone must be HUNG ON THE GALLE FACE for the way that the economy was distorted and the citizens made to pay. Ansar, are you awake? Arjun is not the governor anymore!!! Can’t be a Family favour… Can it?. Because, son Arjun .resigned from perpetual, before the Father in Law got the gig from his old mate Ranil. 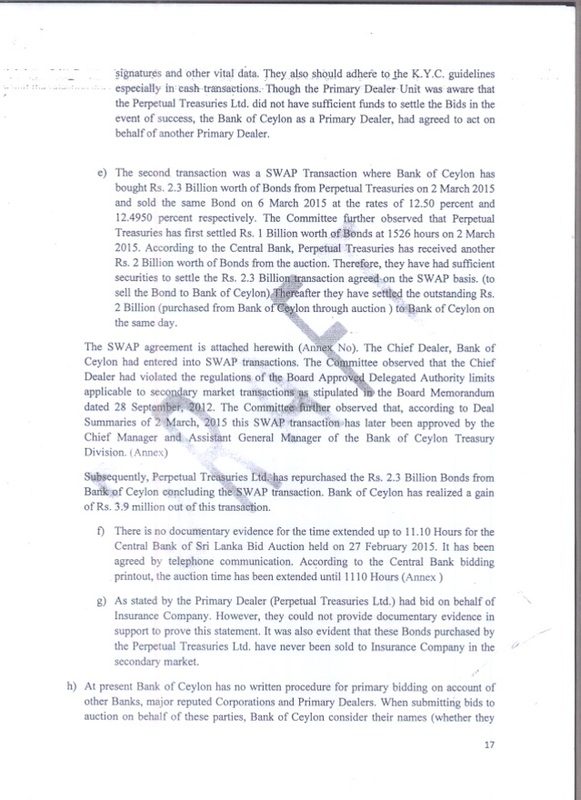 But Geoffry and Arjun are the two share holders of Perpetual. Not a bad return for the Mahendrans at 13 % when the other Tamil Diasporians are struggling to get 2.5 % on their hard earned life savings, collected working rotating shifts and even 12 hour shifts in the First World. BTW, Wonder whether Mahendran’s uncle has a little shareholding as well?. When did you start caring about the Tamil Diaspora? And why? Have you sold your racist soul to LTTE rump? I am with with your mate Samare now, to help Samare to get their non LTTE Money and give our inhabitants Honey..
Could you advise Mangala to look for money belonging to the Dalits of this island which clan has stashed away abroad. 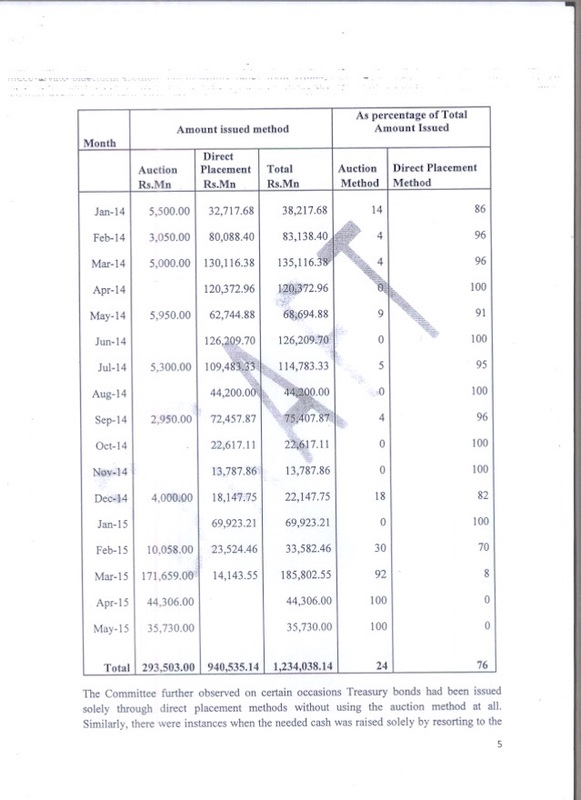 According to Mangala the total is about $18 billion. Are you getting confused a bit now?.. You say Samare has already worked out our Dalits had USD 18 Billion . Samare has now been to every major Financial Hub in the West rubbing shoulders with the Leaders both Western and the LTTE. So why do you ask me ?.. Can you ask Samare, whether those LKR 50,000 which the UNP Christian Faction and as well as the Buddhist Faction both, are now handing out as Santhosams to our Sanga at Sunday Schools in the Bush come from .recent Commissions, NGO Donations or non LTTE rump Santhosams to Yahapalanaya..
Could you now vouch for the thieving clan, that they do not own assets that are disproportionate to their total income. You must include all those benami properties. Means the property which was purchased in the name of some person other than the person who has financed it. The person who has rendered the required money for the said purchase has not purchased it in his name but in the name of some other person’s neme. The person who financed the property has not really purchase and/or purchased it to the benifit of the person on whose name he has purchased it. Means property of any kind, whether movable or immovable, tangible or intangible, and includes any right or interest in such property. The person on whose name the proerty has been purchased is called the benamdar and the property so purchased is called the benami property and the person who has financed the said purchased is referred to as the real owner. No way the clan would nominate you as their trusted “benamdar” for the clan doesn’t have any confidence in you. Note MR’s niece is married to a Tamil Vellala global businessman and a close friend of RW as well. Are you capable of competing with a Tamil Vellala global businessman? Why bring the uncle of the Governor into this equation? The fact that the sister of the former Governor was one of the Board members seems to have been missed by you. 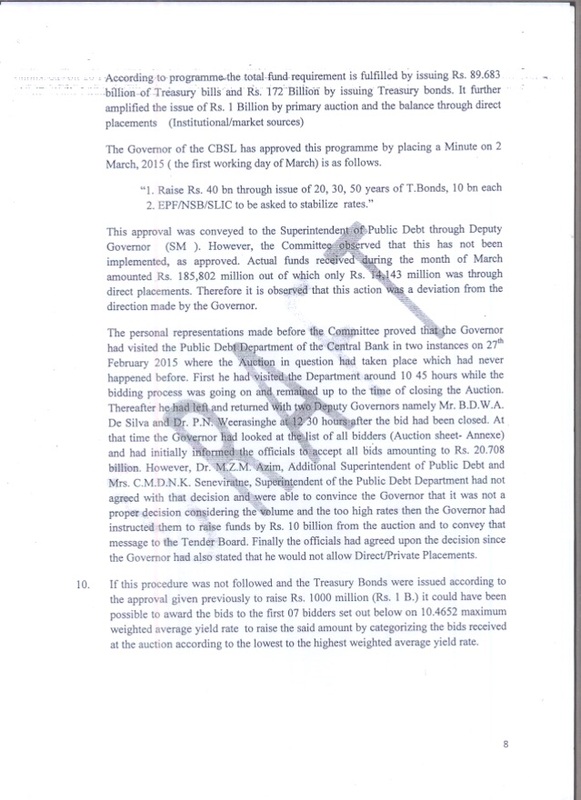 According to “Governor” Arjun Mahendran he did not help his son-in-law at all in this very controversial Bond deal. 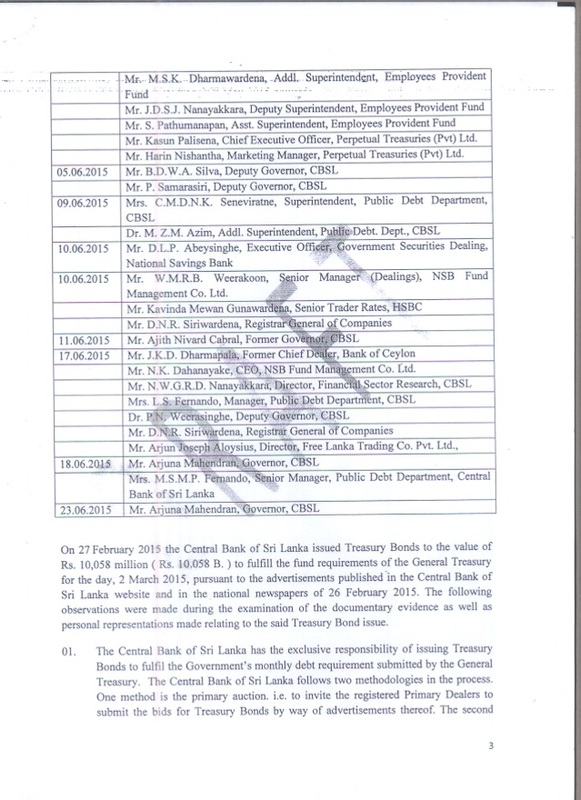 The UNP government in a desperate financial situation wanted 12 billion raised by the Central Bank by next Monday and “Governor” Mahendran had to find it on the previous friday. That is, Mahendran had only one day to save the country from a financial doom. Unknown to him his son-in-law Mr. “Clever” and new rich Aloysius came forward and gave 12 Billion ( by buying the Bonds) and saved the country. Mahendran by his own statement is a very unusual and bad father-in-law. Does he not want his own daughter and her loving husband to live a rich and comfortable life ? Mahendran should throw his masquerade of professionalism to the winds and help his immediate family( who also help the country) to prosper. That is what they all do ! Ranil gets his dirty work done by others. He helps his cronies to swindle without dirtying his hands. This is the type of white collar gentlemanly crime that is committed by good governance gentleman and NGO cabal who hoodwink the general public. They have hoodwinked the President in right royal style. President must realize that when people sit with even unclean pedigreed dogs one will get tics on to oneself. He must be regretting now. What has Maduluwave Sobhitha thero got to say now? Please apologize to the people for the mess he and his good governance promoters got this country into. Has this report been signed all members of the COPE committee.? If not, how was it published? Is it the real report? These are questions without answer. Perhaps,they want to keep Ranil criticised before elections and the interested parties propaganda. Sadly so far no one seems to have pointed out the most incredulous part of the report which is RECOMMENDATIONS. As it unveils the timeline of events, points out outrageous inconsistencies, massive violations and presents a tangible strong case for insider dealing, it recommends APPOINTING A RISK OFFICER???? UPDATING MANUALS????? I mean seriously???? I just cannot believe my eyes. 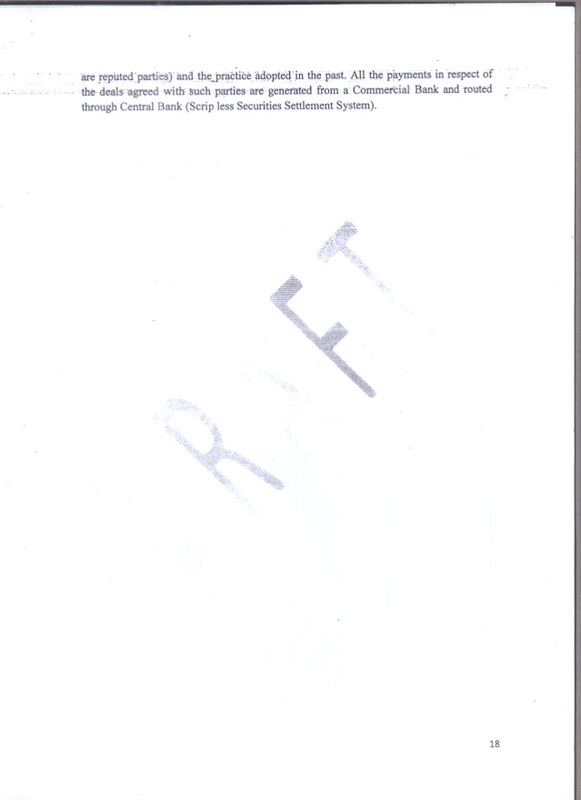 In a report with water mark ‘Draft’ is still in, one can include any rubbish. Is it worth to make comment on this?. No one takes it seriously until it becomes official. Am disappointed that Weerawansa, Duminda Silva and Vasudeva were not in the committee make it in to a 15. The Committee, assisted by a former Deputy Governor of the Central Bank, under its recommendations, has not found anyone guilty of any wrong doing. 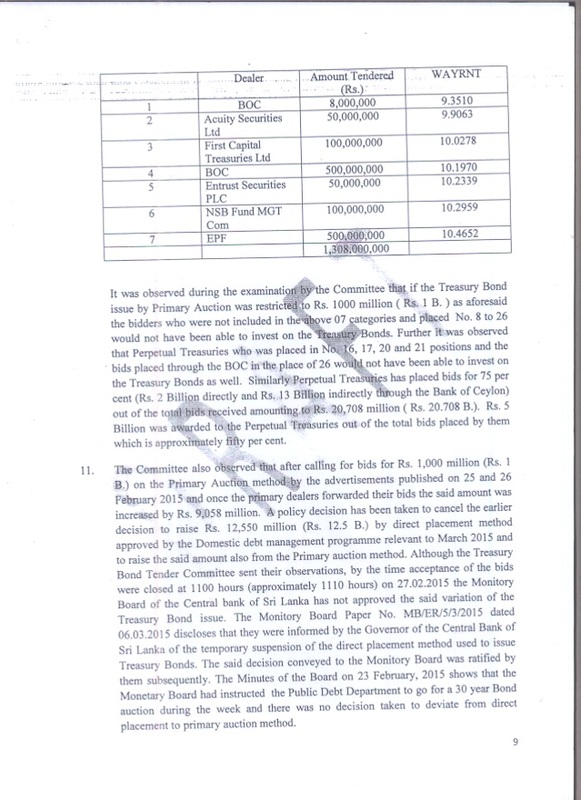 This exonerates Governor A.Mahendran and minister-in-charge Ranil W, from allegations so far made against them, about the Bond issue. is also in the mud. stay alive and keep Ranil away. Who does Ranil appoint as Campaign Manager? to him will not see the light of day. “tomboy” LOL Ranil is not a boy never was, period ! By the Bond issues in long-term is calling it the Central Bank of Volatility. Its sound risky? In fact Bonds of CB long-term made money by exploiting price discrepancies in multiple markets; on the other hand fixed-rate residential mortgage market; Sri Lanka government Bond market ,is the more complex market for INTEREST RATE SWAPS. In real terms Bonds among long-term selling points was the claim that they were a market neutral fund is better. On the other hand they could not be hurt or undermined by a significant movement in any way of the major stock ,bonds and currency markets. Indeed the partners started to worry that they were not taking enough risks. CB- Arjun Mahandara of governor has ignored all situation take into consideration, far from the mundane ups and downs of terrestrial finance. Their target was risk level by 30 years long-term Bonds that corresponding to an annual variation 10% to 11% per cent of their assts. In practice CB governor operating at closer to more than half. The probability of such an event to cause the firm- to lose all its capital in a single year. 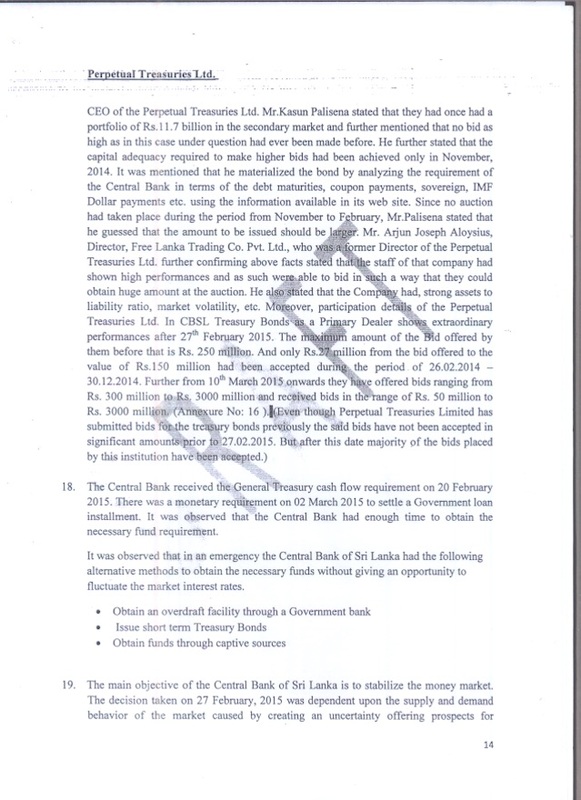 What will be result of UNP Wickramsinghe Smarawickma and Kabir Hussan manipulating inside trading of CB Bonds, sooner or later apparent reason equity market dipped. Well that volatility went up instead of down. The more than double the long -term projection of the more money will lost. The less the funded were worth ,the higher interest rate leverage –the ration of debt to CAPITAL ROSE. For me UNP Junta click it seemed like the dream team of UNP political leadership by Ranil Wick…When bond stocks and currencies losses began to mount many participants, simply withdrew from the market like us, gradually leaving Bond market with largely illiquid portfolio of assets that could not be sold at any price. That is what happen to Greece. Do we want t repeated same path has been an introduce by UNP led Junta politics of moribund economics for Sri lanka? The attacks and criticism on Arjuna Mmahendran are made because he is a Tamil. He has done no wrong and he is innocent. These are all racist attacks because he is Tamil..
PM Ranil actually selected the right person for the job because of Arjun’s high education, high intellectualism, economic expertness and his experience in the bond market and in international financial. Mahe dran for the job and Ranil will go any extend to keep him. Then why are Gandhasara and the Balu Balu Sena fellows doing nothing about this scam? Their silence is deafening and something doesn’t make sense here. This was a preplanned scam by Ranil. That explains why he insisted on appointing Mahendran for the job and took the central Bank from the Ministry of finance in to his fold. Every time you see an daverse remark made about anybody with a Tamil name it becomes racism. The man is a CROOK and always will be. Like Madoff and the Jews of the US banking system. FUll stop. The South Indian Chetty, Prasad Kariyawasam did not not know how to share the looting from the NSA and keep the bosses happy who allocate the job. Now this Singaporean smart guy learning about the Sinhala Intellectual bosses. Why could not have passed everybody’s shared in time? If RW cannot firm the next govt, Arjun is responsible for that big time. We all know that the bond scam is a scandal and people should be held accountable. If Arjun did this in his home country Singapore, he would be in jail. Surprisingly Ravi and Harsha have gone silent. To me, this appears to be a situation of much speculation. Insider dealings are very difficult to prove unless there are wire taps, like in the case of Rajaratnam in the US. 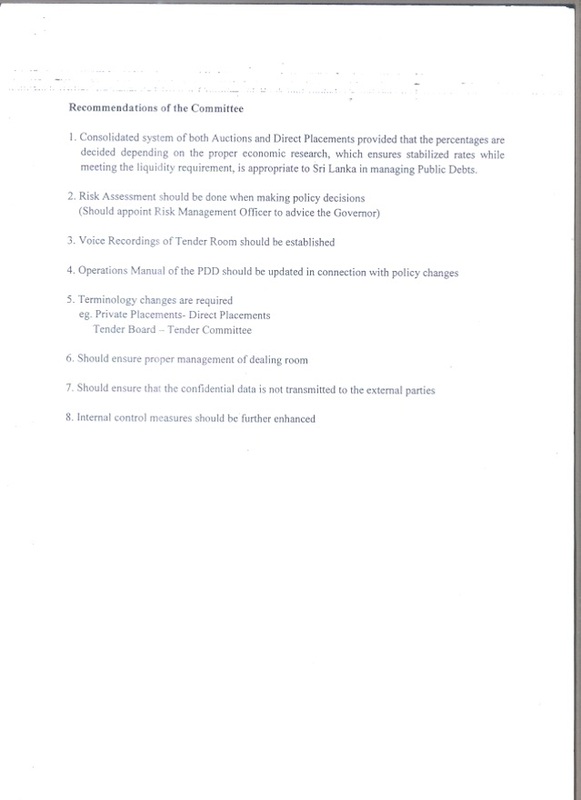 A good lesson to be learned is that there should be voice recordings in the tender room, proper internal control mechanisms enhanced and proper management of dealing room should be put in place and procedures for Private Placements,Direct Placements, Tender Board and Tender Committee should be well defined and brought out in the public domain. These in fact, are some of the recommendations made by the Special Committee appointed to investigate this issue. The present procedure is what has prevailed during the past number of years and even Cabral and those in government under the last regime would have and could have profited in the same way for nearly 10 years and particulalrly with Cabral’s own sister being involved with Perpetual Securities. However, as per the present facts available, a judgments should be given by a court of law and not by a politicized parliamentary committee. The Government has the responsibility of making a detailed explanation on the issue now. we were force fed to believe. a Singapore national and cannot become Sri Lankan citizen. He has todate not sworn an oath of allegiance to Sri Lanka. was no such reference in the report by the lawyers. important. Mahendran comes first. Why oh why? mega scam by Ravi Karunanayake, Finance Minister. Just this week Karunanayake was in Japan looking to borrow money. Governor who is the beneficiary from the bond racket. to cover up cases and stop arrests. People should be alive to these matters. What is the “controversial issue” that precipitated the inquiry? 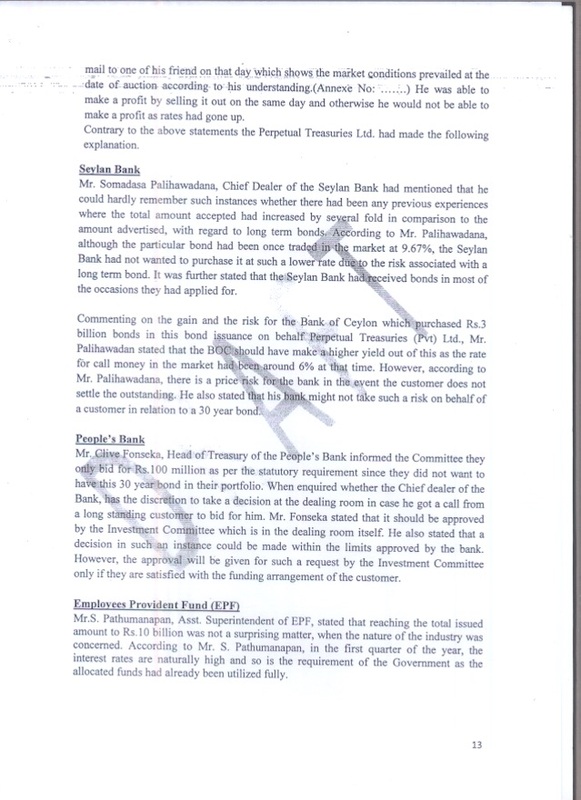 Is it that the owner of Perpetual Treasuries has for some time been married to the daughter of the Chairman of the Central bank of Sri Lanka? What is the “controversy” involved in this? This had better be made clear if the involvement of COPE is to be justified. 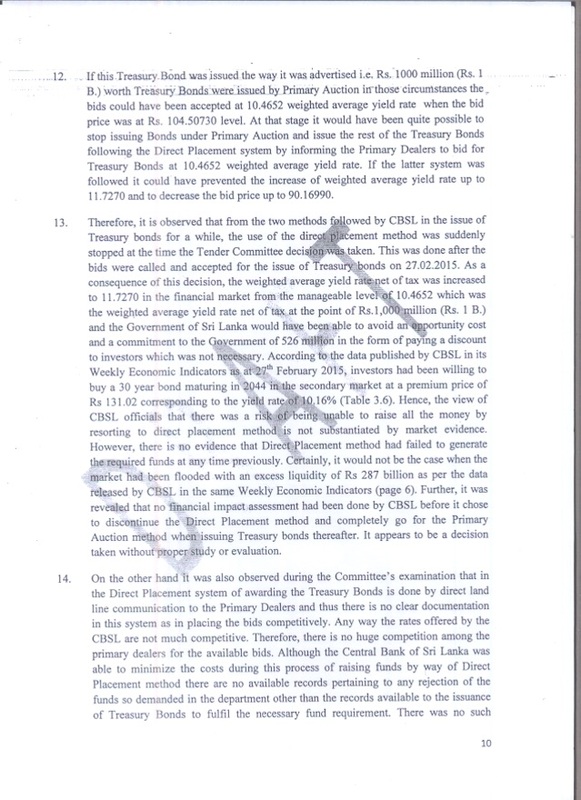 This means that the auction is allowed to set the interest rates and then the central bank negotiates private placements for the balance based on the rates set by the auction. 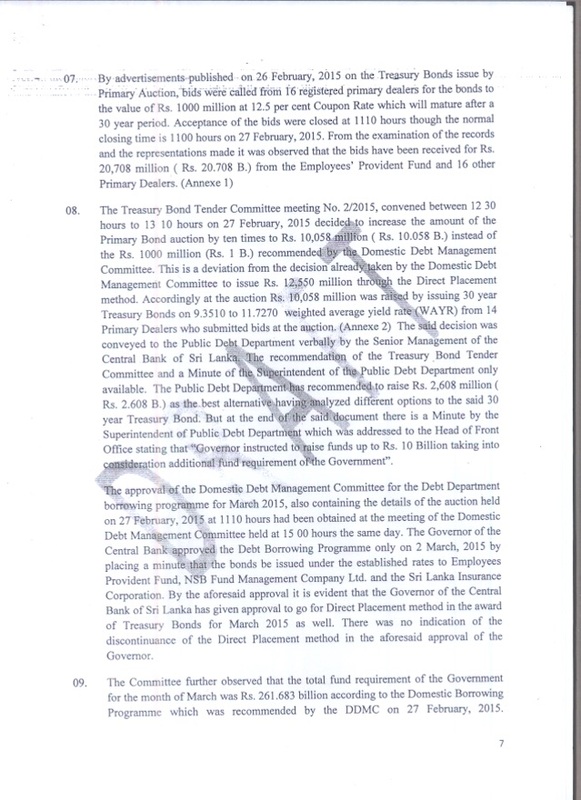 However in the year 2008 citing “unwarranted” increases in the interest rates on government securities the monetary board had authorized the mobilization of funds through direct placements. (MB/PD/1/26/2008) thereby distorting the market and opening the door to the manipulation of interest rates that collapsed the interest earnings of pensioners and other investors and led to the artificial stimulation of the stock market as well. 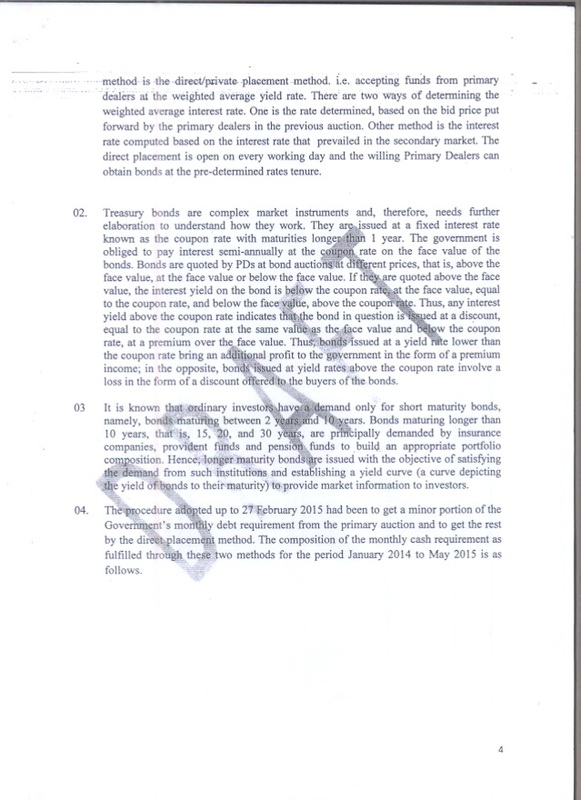 This manipulation of the capital market is what led to the manipulation of the stock market and to the distortion of the economy and this is what is hidden by this report which blandly states in para 04 that “The procedure adopted upto 27th February 2015 had been to get a minor portion of the governments debt requirements from the primary auctions and get the rest by the direct placement method” without commenting on the subversive nature of this practice and its consequences. This was precisely what Arjun reversed and it is this reversal that accounts for the opposition that has arisen from all those who benefitted from the convenient nexus that had developed between the Central bank and its Primary Dealers to the detriment of the economy and the living standards of all those who invested in the capital markets who saw their yields fall from 16% to 6%. Since I have to earn my living I do not have the time to do so but I can with ease analyze this report to show very clearly how this is an attack launched by a collaboration of disgruntled Primary Dealers who are having their and the interests of certain elements within the joint opposition whose ideological commitments are openly opposed to the market economy. Arjun has done nothing illegal and is entitled to compensation for the purely political harassment that he has been put through by this cabal. I would like to reiterate the position that the government must investigate the ideological motivations of this cabal because it is precisely such an unholy alliance of local corporate elites who have enjoyed playing fat cats in a small twenty million strong mud puddle of a market and who are now shivering in fear at the global players and world bank restructuring of the capital markets in order to allow the island to play its potential role, and discredited Marxists and incompetent professionals who cannot face competent global competition who will oppose the generating of the five megapolises and the global financial city that will provide employment and income to the ordinary people. These spoiled brats must be exposed and made to compete in the global market instead of continuing to enjoy comforts at the expense of the working people who are denied a decent income in order to make it possible for these alley cats who dream that they are fat cats to live lazy pampered lives. Its a shame. Not a bugger able to catch him and seize the money if he has robbed. Whether it be which ever party, media, organization or what ever. No one has the guts to nab him if he is a crook. Its just drama. Its a waste of time.